Phase one of the park project will begin before year’s end. Maura Herman had only just heard of the Reading Viaduct. The Temple senior was in her social-media marketing class Thursday when her professor pulled up videos and photos of the abandoned elevated railroad track in Callowhill. He wanted to show how this weedy, rusted overpass had become a touchstone for so many in Philly. How word of mouth - word of Instagram, now - had infused this neglected, beautiful place with energy. In the photos, young people posed in the graffiti-covered ruins of the Spring Garden train station and crossed the 20-foot-high signal gantries like balance beams. They took wedding photos on the train tracks. The skyline seemed to sprout from the weeds. After many years, the professor told the class, funding had finally come through to renovate the viaduct into a real park. So Friday morning, Herman, her pit bull, Zeus, and her friend Nicole Swan had come to experience the viaduct for themselves. "Before it goes away," Herman said, stopping near an elephant-eared Paulownia tree. It's not going away. It's just becoming new again. The viaduct has long retained the feel of mystery in a city becoming less and less mysterious. It's one of the last places in our changing city that still feels undiscovered. Like a secret. But after more than a decade of private fund-raising, the state last month awarded $3.5 million in grant money to the Viaduct Rail Park project. That comes on top of $5 million raised by the Center City District and advocacy efforts by the Friends of the Rail Park, the nonprofit working to make the park a reality. The first phase of the project - transforming a quarter-mile stretch between Broad and 12th into a park with pedestrian pathways, seating areas, swings, community programming, and art installations - is set to begin before year's end, said Michael Garden, vice president of the friends' group. The groundbreaking is truly exciting news. 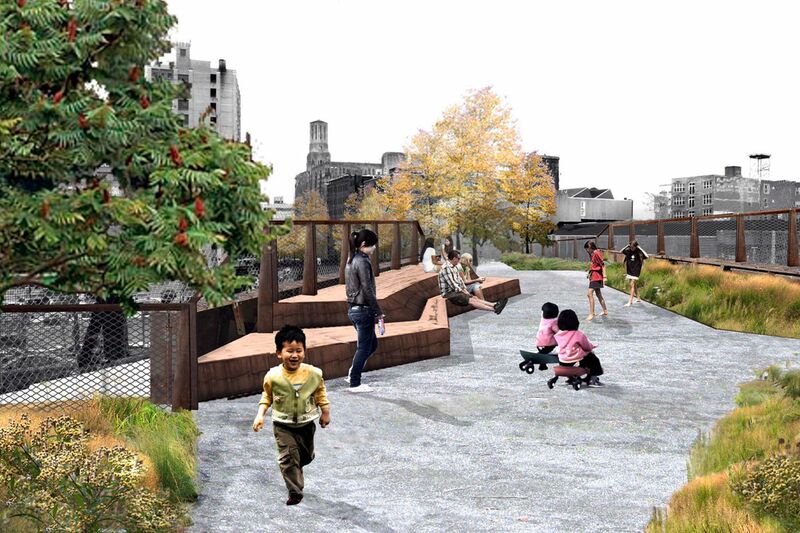 The Rail Park could eventually help remake the city. We should do all we can to make it happen. But as with all progress comes loss - in this case, another slice removed from weird Philadelphia. This Industrial Age remnant that so many claimed as a place of their own will now be all of ours. It will be fully discovered. As it becomes something new, listen to those who have found beauty in it. The ones that come for the grit, the simple thrill (it is trespassing, technically), and, yes, that perfect Instagram shot. Those were Anna Obendorfer's wedding photos the professor showed his class. Originally from rural Chester County, near Coatesville, Obendorfer, 24, was homesick five years ago when she happened upon the entrance to the viaduct after a work event. "It was like my little part of the woods," she said. It is where, she said, she and her husband, Josh Feist, a fellow adrenaline junkie, fell in love. Many days, they slipped through the fences to sit on the beams and drink to the sunset or shoot bottles off the train station platform with her slingshot. For their wedding photos, they brought a bottle of champagne. They found an old frame by the abandoned power converter and posed with it. It felt right. Like them. Photographer Kyle Huff, 28, of South Philly is drawn to the old rail line, the mazes of overgrown weeds and the promise of what it all can become. It allows him to shoot in single photographs the "past, present, and future of the city." Kaelon Soto, 16, climbs the tall gantries after classes at nearby Roman Catholic High School. Up there in the sky, he writes in his journal. He takes the friends he meets on Instagram for tours. "Don't be afraid," he tells them. "If you see anyone, they are probably up here for the same reason we are." To see it before it changes - before it becomes new again and another piece of old Philadelphia disappears.